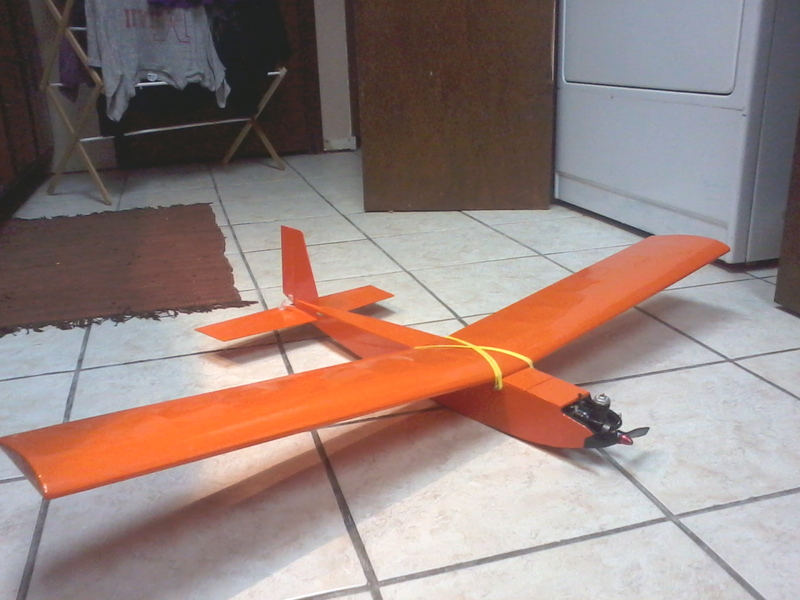 The first plane I built. I fly little helicopters, mostly a Genius CP, so I had a thought...why not build an Airplane! I looked through the internet for an .049 rc airplane plan. I already had a Cox Black Widow ready to use from the 80s. Found some plans for a Kyosho plane called the Papillon, a simple trainer, 2ch., highwing that I could scratch build from balsa. The original thought was that I would build that, then build a second wing with ailerons, then make another into a low wing configuration when I got some more experience. So, a pic of the completed plane! Took it out to my cousin's, he has alot more space than I do...and taller hay for "landing"...and it flew! I posted in the FT Flyer forum, that I had my first Real RC flight with the FT Flyer, but I guess this qualifies as flight even though it was mostly accident avoidance with a lucky glide slope! I plan on getting more confortable with the fomies before I get this plane back out again, and I have nearly completed the second wing with ailerons...keep getting sidetracked with the electric foamboard planes though...and the wind here in ohio! So...Let's see everyones first scratch builds! That really looks nice - and sounds like in the old time. That's pretty cool! My first plane that I ever really got any stick time with at all was a Craft Air Piece O' Cake with a Black Widow 0.049. I actually just found that engine the other day. I now have my old OS Max .10 and my 049 that need to have planes put on them. There's a Super Decathlon that would be great for my .10 and I am really tempted to build another Piece O' Cake for the 049. However, now that I have seen your plane, that is pretty tempting as well! Your plane looks pretty quick! I am guessing that the time with the foam board planes has been nearly invaluable when flying that for first time! I remember how distressing it was for me the first time I flew my Piece O' Cake. My dad really didn't know how to fly RC either, so there was no buddy box. I flew the Piece O' Cake for quite a while, until it wasn't repairable anymore! The wing kicked around in my parents basement for about 20 years, but I have not seen it in a decade or so, so I am guessing it's gone. Looks really good. I taught myself to fly RC with a Gentle Lady and a high start and a power pod. How many Cox piston/sleeves did I wear out? what fun. It's nice that now you can buy a battery, esc and motor that is just plug and play but fooling around with the half A is pretty fun too.